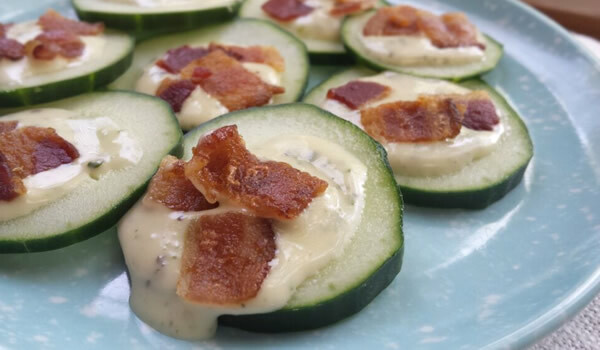 Bacon-ranch cucumbers | Bacon-ranch cucumbers – oh, that's tasty! Talk about a quick, easy Paleo snack: Three ingredients, and NO cooking of any kind! On top of which, two of the ingredients are BACON! and this fabulous, easy, Paleo Ranch dressing. Which — trust me — once you try it, you are gonna wanna keep in your fridge at all times! If you don’t like Ranch, homemade mayo would work well, too. Already-cooked, chopped bacon is another thing that — IMHO — should always be on hand in the fridge. Especially since the best, easiest way to cook bacon means cooking a whole big batch up at a time is no more trouble than cooking a few pieces. So, if you have those two things on hand, and you have a cucumber, you can whip this bad boy up in no time flat! Perfect for a snack, appetizer — or maybe just lunch! You could package the three ingredients separately, and pack them with an ice pack for a work lunch, school lunch, or picnic. Oh you wanna go a little fancier? Sure, add some finely diced tomato, or some snipped chives or dill. Pump up the protein with a little smoked turkey or chopped hard boiled egg. But for instant gratification, those three ingredients will do just fine! Check out my 20-Day Countdown to a New Way of Eating! Follow me on Instagram for more quick, easy healthy food ideas.